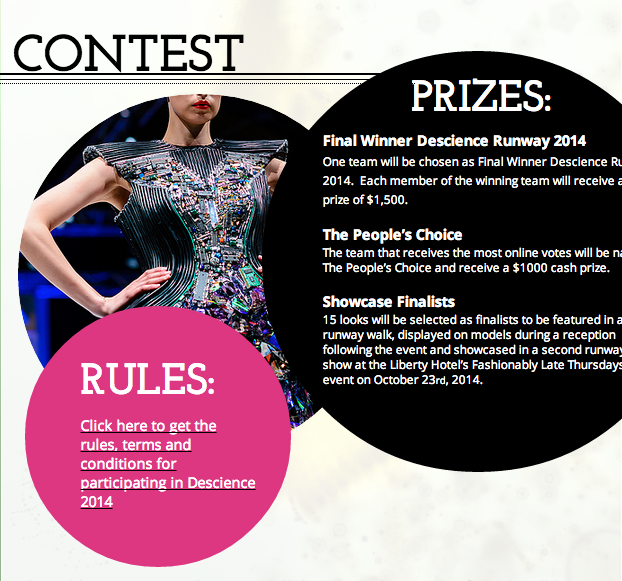 From the website: Descience brings together scientific discovery and fashion inspiration through innovative events. The first major event is a runway show on September 29. Teams, composed of one scientist and one designer, select each other on the basis of their research and design, respectively. Teams actively collaborate, creating garments that represent the scientist’s work and the designer’s vision. Descience Runway 2014 is the first of its kind, serving to communicate science and support the arts in an unforgettable way. Read more here.